Happy 4th of July! This is such a great holiday to have friends and family over, but let’s be honest: It gets expensive to host so many people! However, if you love to have friends and family over to your house, there are so many ways that you can cut costs and still have a great party all at the same time. I’ve included some of my best tips below, which will help to make parties easier on your wallet and more fun for everyone. I know that you’re a great host and that you want to serve all food and drinks yourself, but let people help you! I know that my friends always ask what they can bring to a party, so instead of telling them no say, “You definitely don’t have to, but I haven’t thought of a dessert yet.” I promise you they’ll love showing up and contributing something. It makes people feel good if they can help out. If you have a signature drink, then you don’t have to worry about buying several different types of wine or beer. You can have just one themed drink that sets the tone for the entire party. Look up some great recipes that both the men and women would love. A big punch bowl or two goes a long way, and when the punch is gone, the party is over! It can definitely get stressful to have people over to your house. You always have to clean before they come and clean up more after they leave! If you throw a party at your local park or at the beach, you don’t have to worry about extensive clean up. Paper plates work great when you’re celebrating outdoors, and they make everything much easier on the host. Plus, when it’s not your home, you can relax too. You don’t have to run and around and make sure everyone is okay. Instead, you can put your toes in the sand or push your kid on the park’s swing set just like all your other guests. You can make tons of decorations with free downloads online and a pair of scissors. There’s no need to go to an expensive party stores to buy decorations that you might not use again anyway. Instead, choose personal photos and other memorable decorations that will make a bigger impact. With technology today, there’s no reason at all to hire a DJ. Use your computer or get a small speaker system for your iPod. Put it on shuffle, and enjoy the random tunes that come out of it! As evidenced, there’s really no need to spend a lot of money when you have people over for a party. Remember, your friends and family appreciate the invitation, and most of them would love to contribute by bringing something themselves or helping in another capacity. 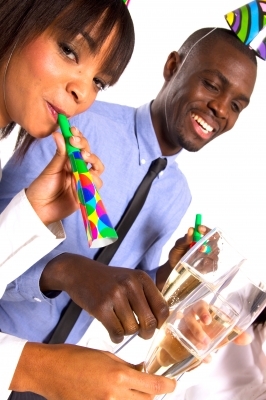 What are some other tips for throwing an inexpensive party? Please share in the comment section below.